BIOSes - Development - SMS Power! 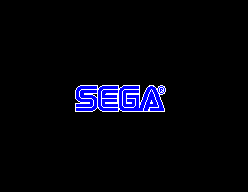 Some Sega systems include a simple BIOS to handle the boot process, display a bumper screen, display instructions/error screens and provide built-in games - or a subset of these. This page describes the behaviour of the various BIOS software known to exist. None of this functionality interferes with the operation of other BIOSes' checks of the header at $7ff0, which may or may not have been deliberate. Only two games are known to boot with this BIOS: the Japanese version of Fantasy Zone, and Choplifter. These are known to be two of the earliest games developed for the Master System. 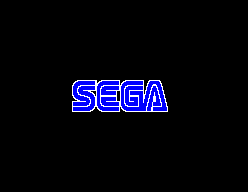 Animated SEGA / Master System bumper screen; it just appears. This BIOS also contains the sound data for an early version of the Sega two-tone "jingle", but it doesn't sound right/finished. Instruction screen when no game is found. 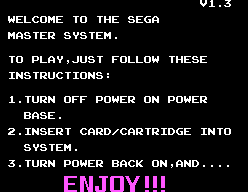 Instead, it displays a simple error screen that just contain the strings "MASTER SYSTEM (c) SEGA 1986", "S/R V1.0", and a blinking "?" If the checksum test fails, there is an extra "CHECK SUM ERROR" string before the "?" The ROM detection port is the same as 1.3, except it doesn't read port $dc, and doesn't distinguish between "no ROM" and "invalid region ROM"
This BIOS checks to see if any of the available slots (card, cartridge or expansion, in that order) have anything attached to them, and boots the first available. This is done using port $3E to map different slots into memory, and checks to determine if valid data was found in any slot. The first thing it does is display an animated bumper screen, as shown on the right. While this is animating, the Sega two-tone "jingle" is played. This is purely to reinforce the Sega Master System brand. It then checks the slots in turn. For each slot, 16 bytes are copied to RAM and checked if they contain a valid ROM header. It does this from offsets $7ff0, $3ff0 and $1ff0 in turn. It checks to see if the first eight bytes match the ASCII string "TMR SEGA"; if so, it proceeds to further tests. If no header is found at any of the three locations, the slot is assumed to be empty. The next check is the region: if the high four bits of the last byte of the header do not equal 4, it is rejected with a "SOFTWARE ERROR" message. If the calculated value does not match the one in the header, a "SOFTWARE ERROR" message is again shown. Otherwise, the slot is booted. The last value written to port $3E is also saved in RAM location $c000 (the first byte of RAM). This allows software released in more than one format to safely use port $3E, if necessary, by using this value to correctly re-enable the slot it booted from. If all slots are found to be empty, an instructional screen is shown. While it is showing, it is possible to press a key combination ( + + on the Player 1 controller; additional buttons may also be pressed and it will still work) to trigger a "secret" Snail Maze game. jr nz, BlockCheckSuccess ; at least one byte of the block doesn't match the first! In the instruction screen tile map, changed "V1.3" to "V2.0"
It checks if there is any variation in the middle four bits of the first 256 bytes in each slot and passes execution to the code in that slot if any variation is found. It may be presumed that the hardware ensures that at least these four bits are held constant for all slots when not connected to anything. Translation: "Turn the power switch to OFF, then please insert some software." It animates the screen while playing the main theme from "Space Harrier" on both the PSG and the YM2413 simultaneously. This BIOS shows the same bumper screen as the US v1.3 BIOS (except the date is changed to 1988). If, at the end of this phase, buttons + + are being pressed on controller 1 (and no other buttons), it runs the same "Snail Maze" secret game as the US/European Master System BIOS v1.3. If not, it checks for valid data on the three slots. This aspect of its operation is almost identical to the US/European Master System BIOS v1.3. However, due to an overzealous optimization in that version (where an opcode's first byte is used as the last byte of the lookup table preceding it), which was overlooked in this version, the $2 checksum range will not be correctly summed. It additionally includes support in the checksum routines to save and restore the current mapped bank (assuming a Sega mapper). If no game is found, instead of showing an information screen, it runs a copy of Hang On and Safari Hunt built in to the BIOS ROM. This game has plenty of unused space for the BIOS routines to be added. This is a 128K ROM requiring slot 2 mapping. This BIOS functions identically to US/European BIOS v2.4 with Hang On and Safari Hunt, except that its built-in game is Hang On. This game is small so most of the BIOS ROM is blank. This BIOS functions almost identically to US/European BIOS v2.4 with Hang On and Safari Hunt, except that its built-in game is Missile Defense 3D", and it does not feature the "Snail Maze" secret game. It was only included with some the "Super System" packages (including 3-D glasses and a light phaser); some of these packages instead had another BIOS and Missile Defense 3D as a separate cartridge. The "Snail Maze" game was probably removed due to lack of space; "Missile Defense 3-D" does not have as much unused space as "Hang On and Safari Hunt". This BIOS features a different bumper screen to previous versions, with just a static Sega logo and no sound. It does not feature the "Snail Maze" secret game. Its checking routines are almost identical to those of the US/European BIOS v4.4. The built-in game is now Alex Kidd in Miracle World. The $2 checksum range bug is fixed, even though the previously released incompatible BIOSes meant that it could not be used. The removed items ("Master System" logo, animation, music, "Snail Maze" game) meant that the checksumming code was minimised and was more feasible to insert into unused space in game with an almost-full ROM. This BIOS displays a slightly different bumper screen to "US/European BIOS with Alex Kidd in Miracle World", and again with no logo animation, music or "Snail Maze" game for the same reasons. the built-in game is now Sonic The Hedgehog. Its checksumming routines seem to be taken from the US/European Master System BIOS v1.3 - they do not feature any of the later changes, and the $2 checksum range bug is not found. It is worth noting that this BIOS was only featured in Master System II systems which have no card or expansion slots; but it attempts to check them anyway. The game itself is slightly different from the cartridge version - to make room for the BIOS routines, the credits have been removed. This is a 256K ROM requiring mapping in both slot 1 and slot 2. The BIOS detection code here has to take a similar approach to the Japanese BIOS, in that it cannot assume there will be a header in the ROM, so there is no checksum or region test. Because it is based on different hardware from the Japanese system (an SMS2 variant), it can take a simpler approach: it assumes that unconnected slots will have their data lines tied high, so it checks if there is any non-$FF data in the first 16 bytes of each slot. Similar to the Sonic BIOS, it checks all three slots (card, cartridge and expansion) even though two of them are not implemented in the hardware. Early Game Gear systems have no BIOS. This BIOS writes and reads two bytes to and from port $02, in order to detect if it is in GG mode or SMS mode so it can use the correct palette data. In GG mode, this port is for the Gear to Gear Cable, and reading it returns what was written; in SMS mode, its use is uncertain, but it seems from the BIOS that it returns something other than what was written. It then checks the cartridge at offsets $7ff0, $3ff0 and then $1ff0 for the ASCII string "TMR SEGA". 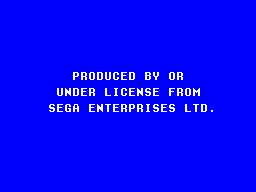 If it is found, it turns on the screen to show a bumper screen with the text "PRODUCED BY OR UNDER LICENSE FROM SEGA ENTERPRISES, LTD." as shown on the right; it then pauses for a few seconds before running the game. If the text is not found, the screen is left turned off and the system is locked up. This BIOS was first noticed in the Game Gear systems released in 2000 by Majesco, but has since been confirmed to be found in many of the later Sega-distributed Game Gear systems, for example in boards manufactured in 1993. All other Sega 8-bit home systems (SG-1000, SC-3000, Mark III) have no BIOS. BIOS PROGRAMMER: JSI, FRONT FAREAST CORPORATION.